Through the years, Chris Kimball, founder and editor of Cook's Illustrated magazine, has dedicated himself to unlocking the secrets behind some of our favorite recipes. His goal is to help home cooks everywhere create dishes that work and taste great every time. His latest solo effort is entitled, "The Kitchen Detective: A Culinary Sleuth Solves Common Cooking Mysteries With 150 Foolproof Recipes." Kimball visits The Early Show on Wednesday to share eight tips and techniques that, he says, are common mistakes or areas of needed improvement in most kitchens. He says following the steps may transform anyone's cooking skills overnight. Kimball says he's not the definitive authority on how all food should be cooked. Rather, Kimball says he has crafted a kitchen reference guide that offers insight into the food research (he's tested and retested his recipes over and over again) he's done to determine what he thinks is the best method for "the desired outcome." Kimball offers tips on the use of salt, olive oil, canned tomatoes, sharp knives, pot roasts, sautéing and chicken. Kimball says food lacks depth and flavor without salt. Even recipes for sweets often call for salt, which helps release the natural flavors hidden within food. Yet, Kimball says, so many of us fail in the kitchen because we haven't learned the basics of salt use. For example, Kimball writes: "A pasta sauce should taste a bit too salty on its own because it is later tossed with pasta. Sauces in general, should be boldly flavored, because they are always served as a compliment to another food. Also, taste for salt five, six, even ten times during cooking. Don't be afraid to add salt in numerous small pinches. Keep at it until you get it right." Where home cooks also go wrong with salt is in the type of salt used. A teaspoon of table salt and a teaspoon of Kosher salt are not the same thing. So, Kimball advices to be mindful of substituting one for the other. Kimball explains table salt is saltier by volume than Kosher salt, and even amongst table salts there can be differences. Kimball says he blows the whistle on Italian olive oil. He explains that the obsession with olive oil was completely manufactured by the Italian Olive Oil Commission. It doesn't matter which olive oil you cook with because the heat kills most of the delicate flavors, according to him. Chris recommends cooking with an inexpensive olive oil to get the same result. When it comes to drizzling or for salad dressing, flavor and quality definitely counts. But Kimball found there isn't always a direct correlation between price and taste. He tested 10 different expensive extra virgin olive oils (from $24 to $80) and threw in an $8.50 supermarket brand that Cook's Illustrated had tested. The supermarket brand (Da Vinci) took fourth in his taste test. A moderately priced Spanish oil (Columela-Hojiblancam, $24 per liter) took second place; and the second least-expensive of the premium brands (Antica Azienda Raineri, $32 per liter) took first place. The most expensive oil in his test came in 10th out of 11. Kimball's message is to let your own personal taste determine the olive oil you use. With the passing of late summer goes the great taste of fresh summer tomatoes. During the cool months, canned tomatoes for sauces and stews are great, but Kimball warns to be careful which ones you select. Whole Tomatoes in Puree: Kimball says to void this product. He says puree gives the tomatoes an unwelcome cooked flavor. Whole Tomatoes in Juice: Kimball says this is a good choice, but be prepared to chop. Juices give the tomatoes a fresh taste. Whole Tomatoes Chopped by Hand: Kimball says whole tomatoes may be chopped finely and will cook very quickly in a pasta sauce. Diced Tomatoes: This is Kimball's favorite. It is packed in juice so they are fresh tasting and ready to use from the can. He says large size of tomatoes is not ideal. A test most every home cook fails is having properly sharpened knives at the ready. A sharp knife makes all the difference in the world when it comes to food preparation and serving. Kimball says if you don't have a sharp knife in the house, don't even bother trying to cook. He also says to forget about buying a sharpening steel and trying to imitate what you think you've seen chefs do on television. If you don't know the technique, a sharpening steel will do you little good. Instead, save a little money and invest in an electric knife sharpener that does three things: medium and fine sharpening, along with regrinding. To test if a knife is sharp, use a knife to slice through a 8 1/2 x 11 inch paper. If the cut is ragged, the knife is dull. Think of your oven as being hot, medium hot, medium, medium-low, or low. Think of it as an imprecise art. Know that the recipe you are about to make was almost certainly tested in an oven, a skillet, or on a stovetop quite different from yours. Don't trust any times given in a recipe. Try to read between the lines to understand what the food should feel and smell like when it is done, and then use your own judgment. Kimball says long live the day when you can cook a cut meat such as shank (lower leg), chuck roast (from the forequarter of the animal), round roast (the area from the hip to the knee), oxtail and brisket and not end up with something dry and tough. The key Kimball found is to cook tough meats at low temperatures long enough for the collagen (the waxy rivulets seen in tough pot roast) to break down. A low oven temperature keeps the outer layer of the meat from drying out while the inner meat cooks slowly. The key to a good sauté, Kimball says, is to add the oil first and then heat the skillet. Watch the oil. It will start to shimmer in the pan, and then it will start to smoke. Kimball says at the point at which small curls of smoke start to rise from the pan, it is hot enough for sautéing. 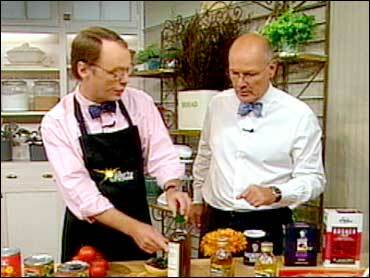 Kimball says sometimes you may want to use equal portions of olive oil and butter to sauté. Also, the pan should never be crowded. When preparing chicken for stews or braises it's best to truly brown the chicken and use as much of the dark meat as possible for that's where the flavor is hidden, according to Kimball. The darker the chicken parts, the more fat to be rendered, which equals more flavor released.